After the acrimonious departure of vocalist Ian Gillan (with bassist Roger Glover being shunted out shortly after), Deep Purple regrouped with then unknown David Coverdale and former Trapeze bassist Glenn Hughes, who acted as a second vocalist. The two new guys, alongside Ritchie Blackmore, Jon Lord and Ian Paice, delivered a great album 'Burn' and were one of the headliners at the California Jam, which had sold two hundred and fifty thousand tickets – but far more people turned up, with claims of anything up to four hundred thousand actually there. The band had agreed to go on at dusk to take advantage of the lights, but unusually the concert was running early. 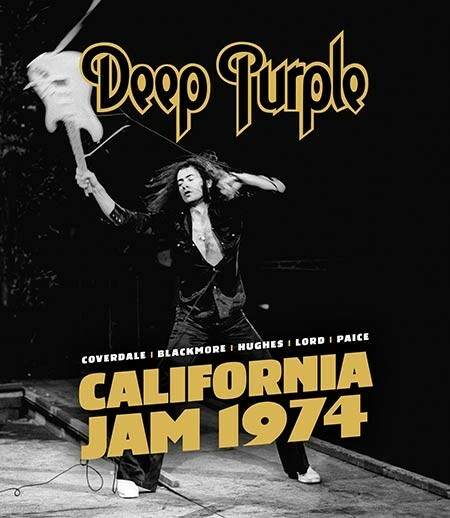 Blackmore refused to go on until the agreed time, resulting in backstage tension and a restless crowd – but when Purple did take the stage, they were fired up. Despite only months prior he'd been singing in working men's clubs, Coverdale doesn't seem too worried about the fact he can't even see where the massive crowd ends. He just gets on with delivering 'Might Just Take Your Life' and 'Lay Down, Stay Down', trading vocals with a swaggering Hughes while the band tear through their current material. Coverdale hits his stride on 'Mistreated', giving a powerful performance, before tackling one of the few Gillan era tracks, 'Smoke On The Water'. It's enthusiastically received before an excellent 'You Fool No One' gives way to an astonishing Paice drum solo. The band regroup for a mammoth rendition of 'Space Truckin'' which is where the fireworks happen – literally. Annoyed by earlier events, Blackmore is also unhappy about the proximity of a cameraman. The guitarist lashes out at the camera, then trashes said guitar, before his roadie sets fire to his amps, which had been doused in petrol to ensure they ignited. However, the roadie was somewhat liberal with the gasoline and the amps actually explode, the force of which causes Blackmore to do a bizarre little dance and sees the stage catch fire, while Lord, Paice and Hughes continue playing in the smoke like this happens every night. Never planned for release, the original ABC footage has been digitally restored to a good standard and this is therefore the definitive version of this legendary concert. It's not the best show MK III would deliver musically in my book, as it's so early in their touring, but one that's worth owning for notoriety alone.